VEGANVILLE: What Do You Call Hoppin' John A Week Later? What Do You Call Hoppin' John A Week Later? Y'all know what Hoppin' John is dontcha y'all? I had a Southern accent once. It's true. I adopted a Southern accent after living in what I affectionately dubbed "the armpit of the South". I drank a lot of tequila in those days. Slurring my words could easily pass as a drawl. I was a veg back then too. My diet consisted of grits, hush puppies and spirit water. My favorite book about the South is "Tequila a Mockingbird". Did I just lose 15 readers? Bahahaha. Enough tangentialism... Back to Hoppin' John. Does this make this a blog hop now? What are those things anyway? Blog hops. Hmmm. Hoppin' John is a dish that is traditionally eaten in the South on New Year's Day. 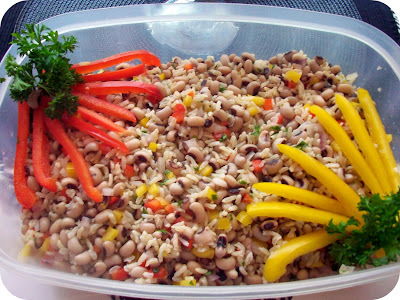 Hoppin' John always includes black eyed peas. I think black eyed peas represent prosperity. Either that or a can of black eyed peas will become a collectible. So remember to save black eyed pea cans. Here's your trivia of the day: If you eat Hoppin' John as a leftover (like on January 2nd) it's no longer called Hoppin' John. What's it called? Hint 2: She married a short Scientologist. If you guessed "Leapin Katie" you are correct!!! Leapin Katie is leftover Hoppin John! We had a small gathering of friends who mean a lot to us (and also had no place else to go) over on New Year's Day. My friend Marcia and I had both planned to make Hoppin' John. So dang it we had a shoot out, to see which Hoppin' John was left standing. 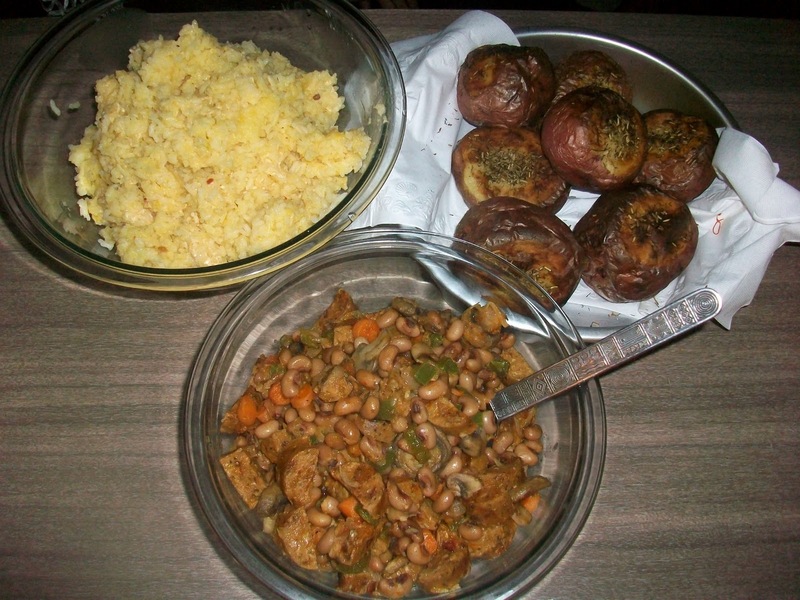 Actually both Hoppin' John's were vegan of course, but that's where the similarity ended. Marcia made a Hoppin' John salad, that was as lovely as it was delicious. Marcia remembered that I have a gag reflex when it comes to celery, but had forgotten that the gag reflex only happens with cooked celery. Marcia left it out even though the salad was cold. You could make it either way, with or without celery but it would be unlikely since I didn't get the recipe from Marcia. I'll hit Marcia up for it though. We'll probably have coffee and celery sticks later this week. I want Marcia to come work with me!!! Below is reason # 575 I want to work with Marcia again! I love her salad. You can cook your Basmati rice in a separate pot than the Hoppin' John. You can make any kind of rice you like. I'm partial to Basmati. The color of the rice comes from the broth it's cooked in (and the Daiya that is later added). Rinse and drain the rice and then add with broth to a big sturdy pot. Bring to a boil and then turn to low. Spray another large pot with cooking spray and saute onion, and garlic for about 4 minutes, add carrots and pepper, and Tofurky and cook for another minute. Salt to taste. Add the drained and rinsed black eyed peas, and the remaining broth and seasoning mix. It should be ready about the same time as the rice. How cool is that. Cook the rice for about 17-20 minutes. When I cook basmati it almost always takes 17 minutes. Stir in the Daiya, and salt to taste. Remove from stove. Serve with vegan sour cream, Tabasco, spinach, balsamic, even roasted red potatoes. Happy New Year y'all. Here's to a prosperous, healthy, compassionate 2012. Remember to stock up on those black eyed peas! I had no clue about Hoppin John taking on a new name after the New Year. I live in the South and I'm not even all that familiar with it. To my defense, I'm not from the south though. If all hoppin John's were like your recipe, I'd surely eat it! Happy New Year! Did you just lose 15 readers??? Are you kidding? With a freaking awesome joke like Tequila Mockingbird, you just earned the respect of 20! That had me bursting with laughter. And yeah, I totally did NOT guess the trivia correctly... I'm bad at that, apparently. Aww, thank you Amanda. Do you have a drawl now? Make this and you will be sayin y'alls with the best of them. Oh no, Cara you are the movie trivia queen! Thank you! Yay, it's a very good book too. Does looking at a picture of hoppin' john count? If not, I'm screwed in the luck department because I completely forgot to make or eat any black-eyed peas this year. If anything bad happens, I'll know it was my fault. Yes it does ,Andrea. Cancel-cancel that statement. You are not screwed. I'm sending you a dollar. Sorry, I'd send more but postage just went up. PS I made a huge pot of hoppin john and put it in a small bowl. Looks like you make some of the best curries, Richa!!! OOh, just did. twice just to make sure.